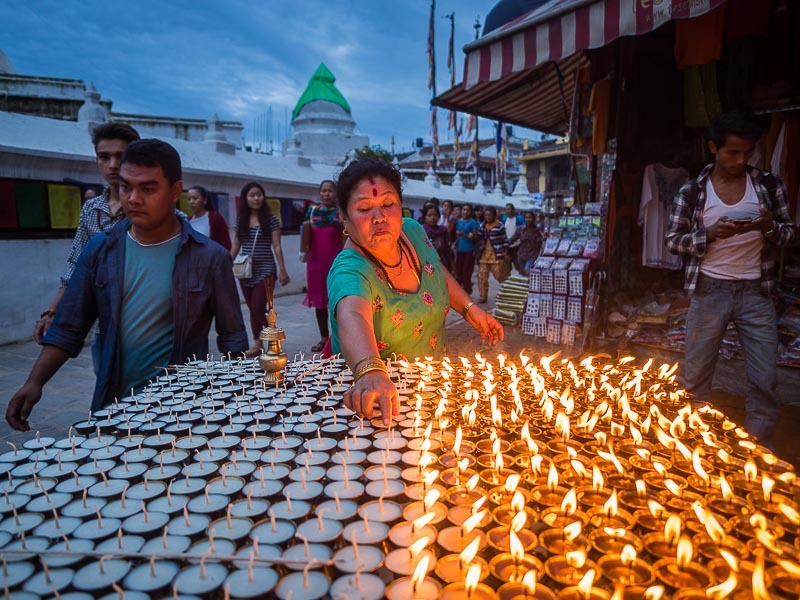 Lay people and clergy light butter lamps in front of Boudhanath Stupa during the full moon procession. 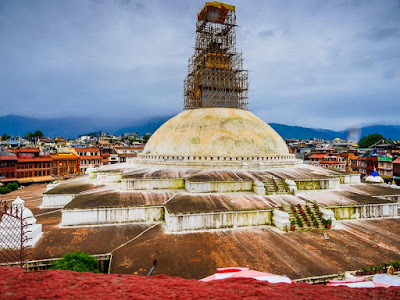 Boudhanath Stupa is a large Tibetan Buddhist stupa in Kathmandu. 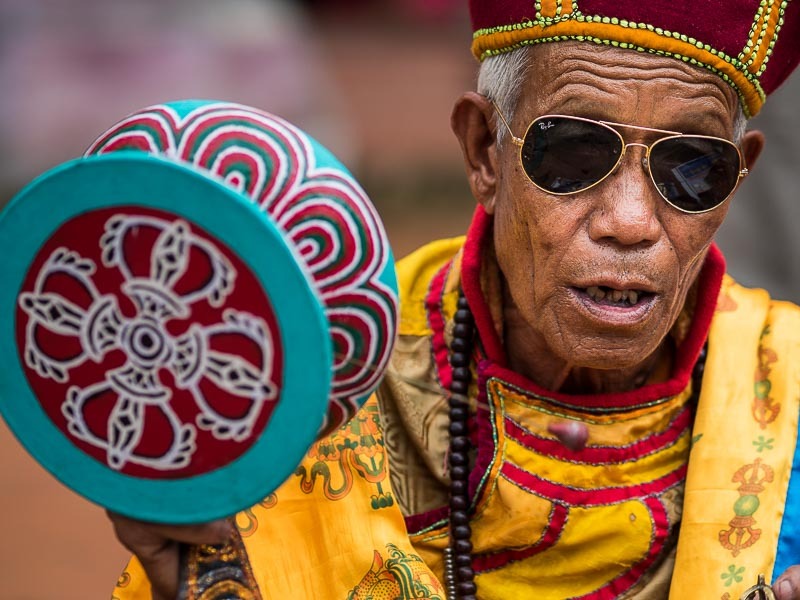 It's a sacred site to Nepali and Tibetan Buddhists and one of the most popular tourist sites in Kathmandu. The community around Boudhanath used to be a village on trade routes between India and Tibet, but as Kathmandu has grown, the village has been absorbed into the Nepalese capital. The stupa dominates the community. The scaffolding above the stupa is for repairs caused by the earthquake of April 2015. There is still a village feel to Boudhanath though. 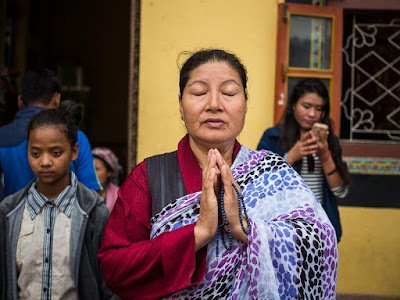 Partly because the huge stupa dominates the area and sets it apart, partly because the Tibetan Buddhists who live here give the area a distinctly different vibe from Hindu Kathmandu. Thousands of Tibetans, fleeing Chinese repression in their homeland, live in the area surrounding Boudhanath. 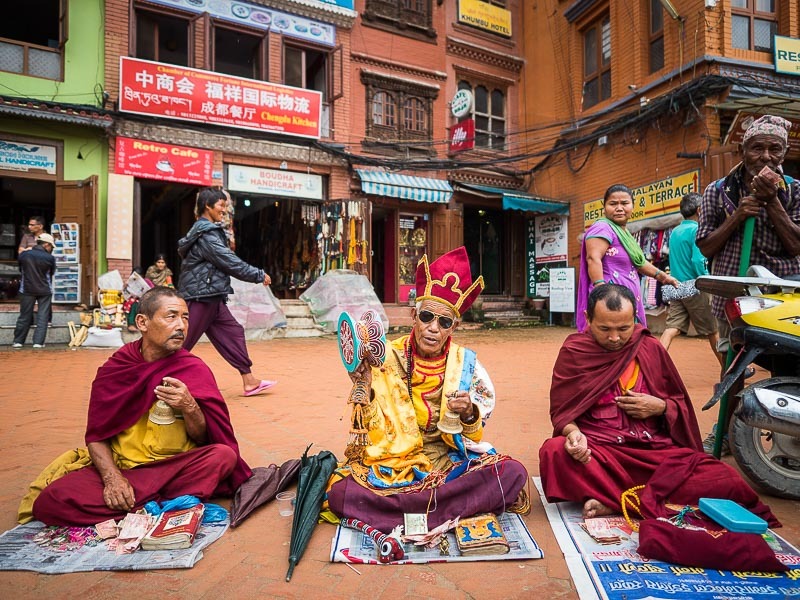 There are more than 50 Tibetan monasteries in the alleys that radiate away from the stupa, like spokes radiating out from a wheel's hub. Buddhist monks chant on the plaza around the stupa. 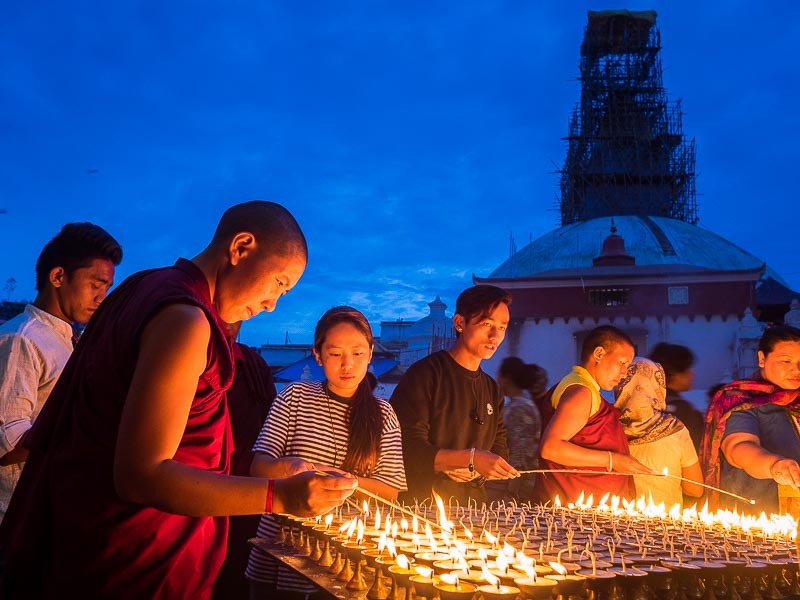 Every month, on the night of the full moon, thousands of Tibetan and Nepali Buddhists come to the stupa for a procession. Before the earthquake that devastated Nepal, people would silently walk along the sides of the stupa. Sadly, the earthquake damaged the sacred site and now people walk around the exterior of the stupa, stopping to light butter lamps and candles and offer prayers. A woman prays on the perimeter of the stupa. Lighting butter lamps during the procession. If you're in Kathmandu on a full moon night, you owe it to yourself to visit Boudhanath Stupa - it's a spectacular site. The are more photos from the full moon procession in my archive or available from ZUMA Press.